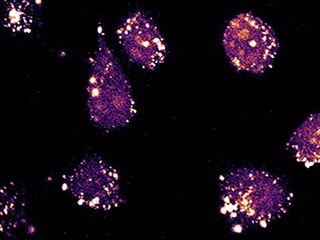 I'm currently CNRS Research Director in the group of Pr. 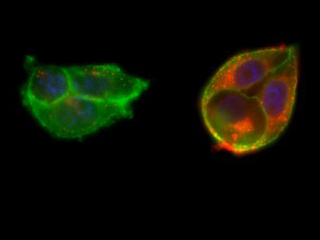 Patrick Couvreur at Institut Galien Paris-Sud (UMR CNRS 8612), at the Faculty of Pharmacy of Châtenay-Malabry, University Paris-Sud, France. 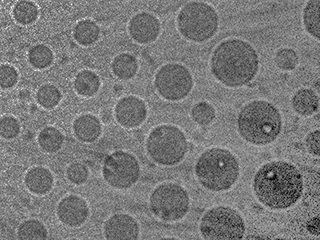 The Institut Galien Paris-Sud aims to design, synthesize, characterize and evaluate new drug delivery systems for the controlled release and the targeting of drugs. Pr. 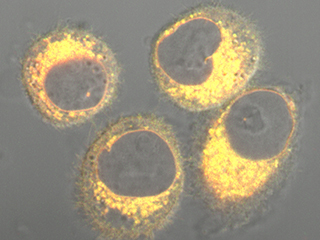 Patrick Couvreur's research group is working on the use of nanomedicines for cancer therapy as well as neurodegenerative and infectious diseases. 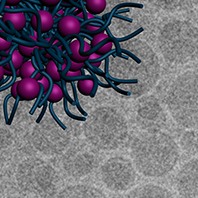 My contributions in this multidisciplinary research group are based on advanced macromolecular synthesis, physico-chemistry of colloids and bioconjugation, in order to develop efficient and innovative polymer biomaterials and nanomedicines. 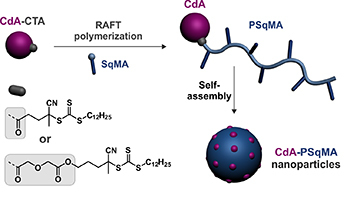 Our review article titled "From Poly(Alkyl Cyanoacrylate) to Squalene as Core Material to Design Nanomedicines" is accepted in Journal of Drug Targeting. Great to all! 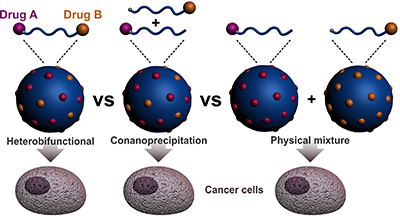 Divya's review article titled "Cathepsin-Sensitive Nanoscale Drug Delivery Systems for Cancer Therapy and other Diseases" is accepted in Advanced Drug Delivery Reviews. Great news! 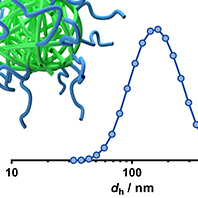 Daniele's article titled "Heterotelechelic Polymer Prodrug Nanoparticles: Adaptability to Different Drug Combinations and Influence of the Dual Functionalization on the Cytotoxicity" is accepted in Journal of Controlled Release. Congrats! Interview by Novacap of Julien, Johanna and Daniele following the 2018 Novacap award of the French Academy of Sciences (in French). 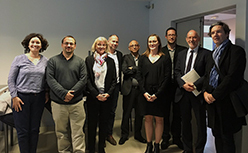 Congratulations to Johanna who successfully defended his PhD, titled "Polyesters Fonctionnels par Polymérisation Radicalaire par Ouverture de Cycle, une Plateforme Nanoparticulaire pour la Délivrance de Principe Actif pour les Maladies Cardiovasculaires" in front of the following committee: Muriel Lansalot, Jean Coudane, Simon Harrisson, Didier Gigmes, Elias Fattal, Patrick Couvreur and Julien Nicolas. 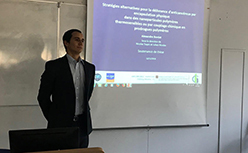 Congratulations to Alexandre who successfully defended his PhD, titled "Stratégies Alternatives pour la Délivrance D'anticancéreux par Encapsulation Physique dans des Nanoparticules Polymères Thermosensibles ou par Couplage Chimique en Prodrogues Polymères" in front of the following committee: Rachel Auzély, Dominique Hourdet, Elisabeth Garanger, Elias Fattal, Nicolas Tsapis and Julien Nicolas. 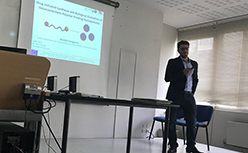 Congratulations to Daniele who successfully defended his PhD, titled "Drug-Initiated Synthesis and Biological Evaluation of Heterotelechelic Polymer Prodrug Nanoparticles" in front of the following committee: Anne-Françoise Mingotaud, Bruno De Geest, Maria Jesus Vicent, Boris Vauzeilles, Francesco Nicotra, Yohann Guillaneuf, Patrick Couvreur and Julien Nicolas. 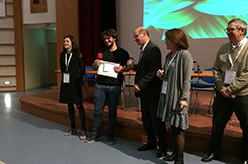 Daniele received the best oral communication award at the SFNano 2018 congress in Montpellier. Congratulations! 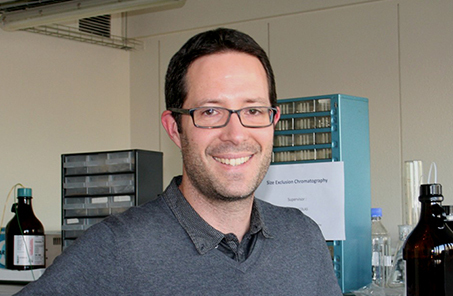 Interview of Julien by Université Paris-Saclay "Julien Nicolas: Boosting Drug Efficiency". 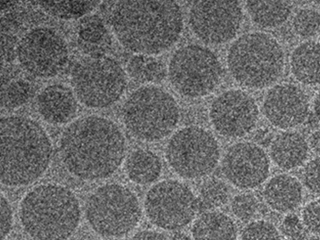 Johanna's article titled "Degradable Copolymer Nanoparticles from Radical Ring-Opening Copolymerization between Cyclic Ketene Acetals and Vinyl Ethers" is accepted in Biomacromolecules. Congrats! 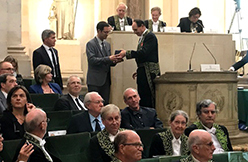 Julien received the 2018 "Prix Novacap de l'Académie des Sciences" during the Award Ceremony at the French Academy of Sciences. Alexandre's review article titled "Thermoresponsive Polymer Nanocarriers for Biomedical Applications" is accepted in Advanced Drug Delivery Reviews. Congrats! 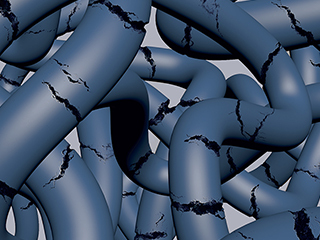 Julien's collaborative Editorial titled "Best Practices for New Polymers and Nanoparticulate Systems - How Not To Be Soft With Reporting Standards" is published in Chemistry of Materials. 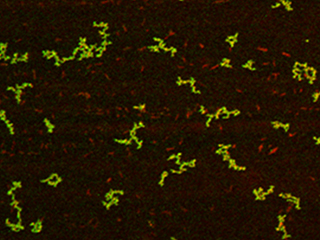 Press release by the CNRS concerning our collaborative article in J. Control. 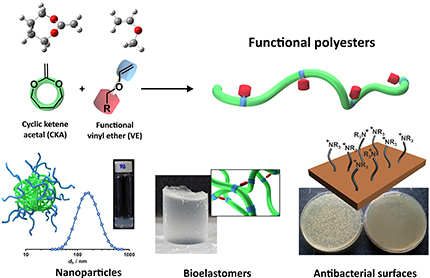 Release, titled: "Des polymères pour une libération contrôlée de différents médicaments"
Elise's article titled "Degradable Polymer Prodrugs with Adjustable Activity from Drug-Initiated Radical Ring-Opening Copolymerization" is accepted in Chemical Science. Excellent job! 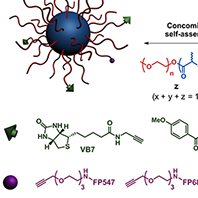 Daniele's article titled "A Facile Route to Heterotelechelic Polymer Prodrug Nanoparticles for Imaging, Drug Delivery and Combination Therapy" is accepted in Journal of Controlled Release. Congrats! 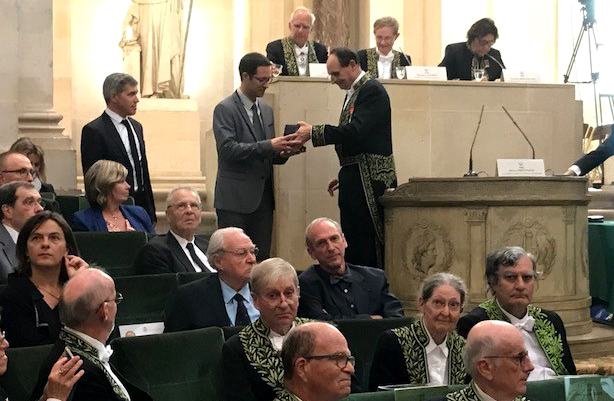 Julien received the 2018 Prix Novacap de l'Académie des Sciences for his outstanding research in the field of innovative polymers for biomedical applications. 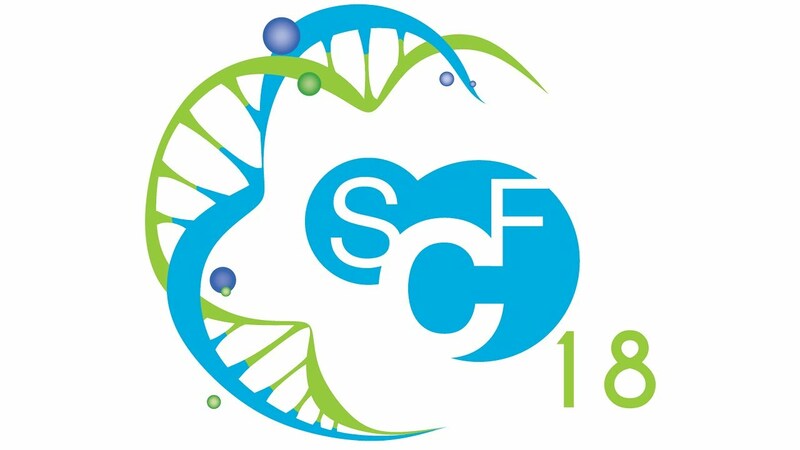 Julien delivered an invited lecture titled "Synthesis of Degradable Vinyl Polymers for Biomedical Applications" at the French Chemical Society 2018 (SCF 18) congress, Montpellier, France. 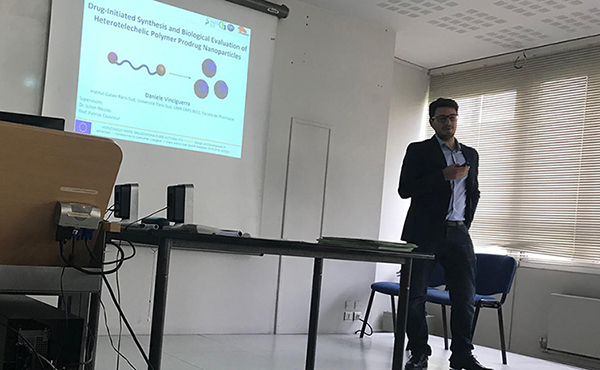 Julien delivered an invited lecture titled "Synthesis of Degradable Vinyl Polymers for Biomedical Applications" at the Bordeaux Polymer Conference (BPC 2018), Bordeaux, France. 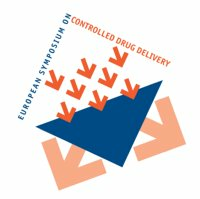 Julien delivered an invited lecture titled "Vinyl Polymers for Biomedical Applications" at the 15th European Symposium on Controlled Drug Delivery (ESCDD 2018), Egmond aan Zee, The Netherlands. 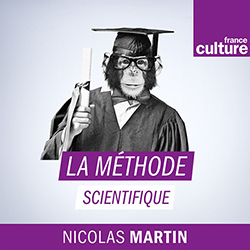 Interview (in French) about Nanomedicine during the Radio show "La Méthode Scientifique" broadcasted on France Culture. 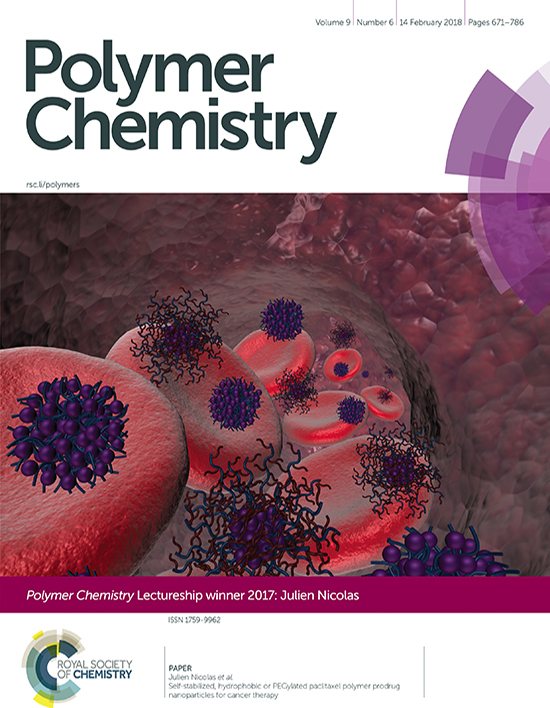 Julien's invited Research article entitled "Self-Stabilized, Hydrophobic or PEGylated Paclitaxel Polymer Prodrug Nanoparticles for Cancer Therapy" made the front cover of Polymer Chemistry! 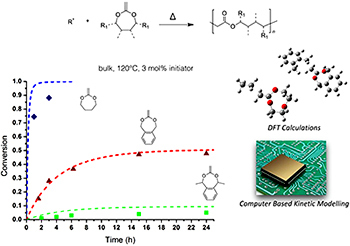 Elise's article titled "Tunable Degradation of Copolymers Prepared by Nitroxide-Mediated Radical Ring-Opening Polymerization and Point-by-Point Comparison with Traditional Polyesters" is accepted in Macromolecules. Bravo! 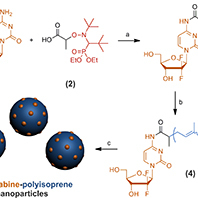 Yinyin's article titled "Hydrophobic or PEGylated, Self-Stabilized Paclitaxel Polymer Prodrug Nanoparticles for Cancer Therapy" is accepted in Polym. Chem. Congrats! Our collaborative article titled "Antibody-Functionalized Polymer Nanoparticle Leading to Memory Recovery in Alzheimer’s Disease-like Transgenic Mouse Model" is accepted in Nanomedicine NBM. Congrats to all! 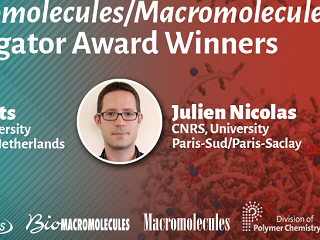 Julien has been awarded by an European Research Council (ERC) Consolidator grant (2018-2023) for a research project titled THERMONANO. 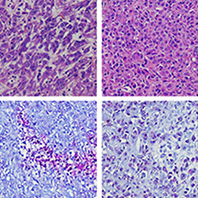 The idea is to develop a new strategy for the administration of anticancer drug that is simple, efficient, comfortable for the patient and significantly less costly than traditional chemotherapies. 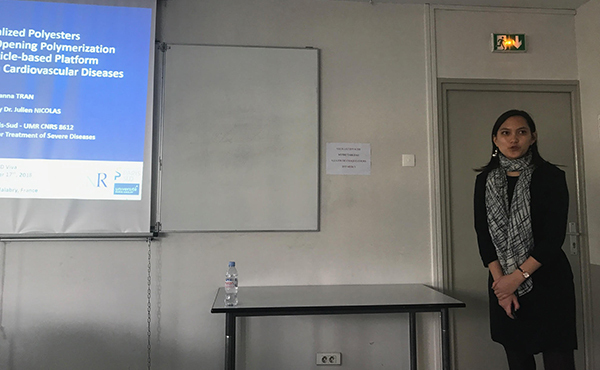 Johanna delivered a lecture titled "Radical Copolymerization of Vinyl Ethers and Cyclic Ketene Acetals: a New Platform to Challenge Traditional Polyesters for Biomedical Applications" at the SFNano 2017 meeting, Bordeaux, France. Bravo ! 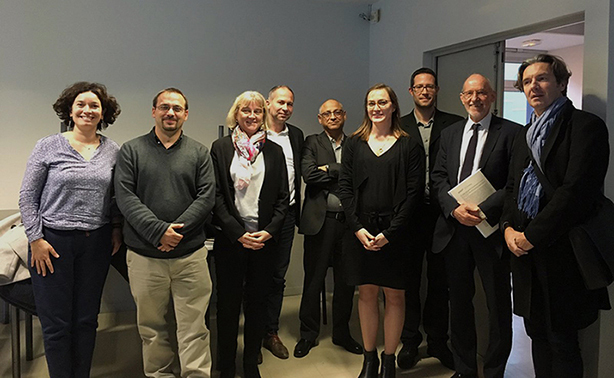 Congratulations to Elise who successfully defended her PhD, titled "Degradable Polymer Prodrugs Synthesized by Nitroxide-Mediated Radical Ring-Opening Polymerization" in front of the following committee: Sophie Guillaume, Sagrario Pascual, Sébastien Lecommandoux, Philippe Guégan, Yohann Guillaneuf, Elias Fattal, Patrick Couvreur and Julien Nicolas. 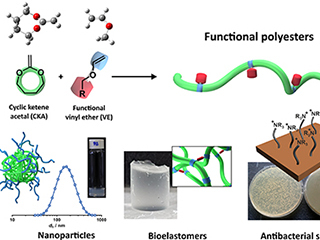 Our feature article titled "Telechelic Polymers from Reversible-Deactivation Radical Polymerization for Biomedical Applications" is accepted in Chem. Commun. Congrats to all! 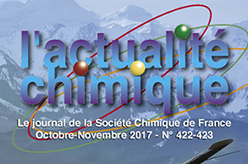 Press release by the CNRS concerning our collaborative article in Angewandte Chemie, International Edition, titled: "Radical Copolymerization of Vinyl Ethers and Cyclic Ketene Acetals as a Versatile Platform to Design Functional Polyesters"
Julien delivered a lecture titled "New Polymers and Strategies for Drug Delivery Applications" at the GFP 2017 meeting, Paris, France. Our collaborative paper (with Didier Gigmes and Didier Letourneur's groups) titled "Radical Copolymerization of Vinyl Ethers and Cyclic Ketene Acetals as a Versatile Platform to Design Functional Polyesters" is accepted in Angew. Chem., Int. Ed. Congrats to all! 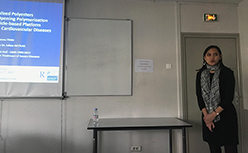 Elise delivered a lecture titled "Development of Degradable Polymer Prodrug Nanoparticles for Cancer Therapy" at the 34ème Club Emulsion, Lyon, France. Congrats! 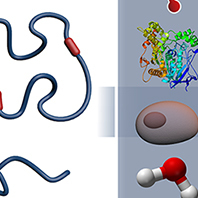 Julien published a collaborative article in l'Actualité Chimique (in French) titled: "Polymères et Interactions avec les Milieux Biologiques" as part of a themed issue titled "Polymères de Demain, Boosters d'Innovations". 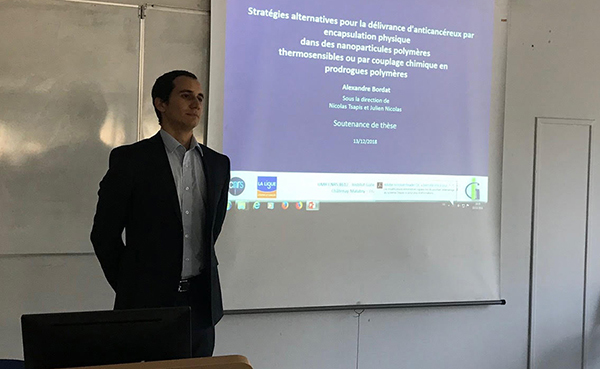 Julien delivered an invited lecture titled "Innovative Polymers for Drug Delivery Applications" at the Chemistry division of the French Academy of Sciences, Paris, France. Megan's paper (collaboration with Brent Sumerlin's group) titled "Radical Ring-Opening Copolymerization of Cyclic Ketene Acetals and Maleimides Affords Homogeneous Incorporation of Degradable Units" is accepted in ACS Macro Letters. Congrats! 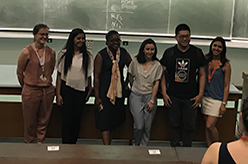 Julien delivered an invited lecture titled "New Polymers and Strategies for Drug Delivery Applications" at the 254th American Chemical Society National Meeting & Exposition, Washington, DC, USA. 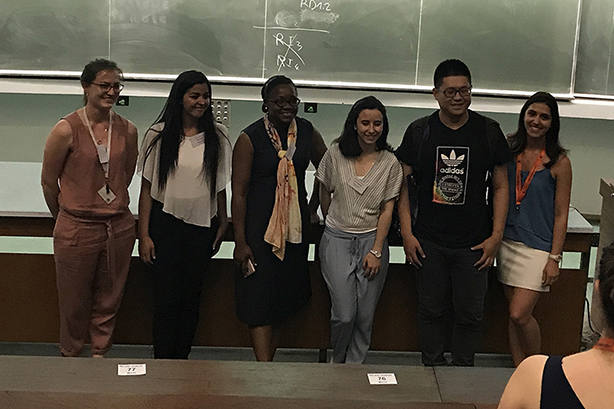 Elise delivered a lecture and received the second best oral communication award during the 2017 Doctoral School meeting in Châtenay-Malabry, France. Bravo !! Julien received the 2017 Polymer Chemistry Lectureship award by Associate Editor Christopher Barner-Kowollik during the Advanced Polymers via Macromolecular Engineering (APME) 2017 congress in Ghent, Belgium. 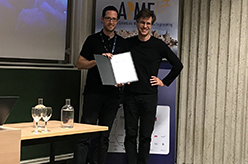 Julien delivered an invited lecture titled "New Polymers and Strategies for Drug Delivery Applications" at the Advanced Polymers via Macromolecular Engineering (APME) 2017 congress in Ghent, Belgium. 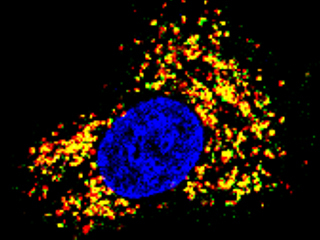 Yinyin's paper titled "Structure-Cytotoxicity Relationship of Drug-Initiated Polymer Prodrug Nanoparticles" is accepted in Polym. Chem. Congrats Yinyin! 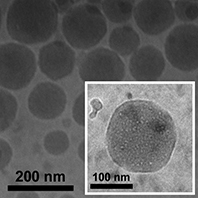 Yinyin's paper titled "Fluorescent Polymer Prodrug Nanoparticles with Aggregation-Induced Emission (AIE) Properties from Nitroxide-Mediated Polymerization" is accepted in Chem. Commun. Congrats Yinyin! 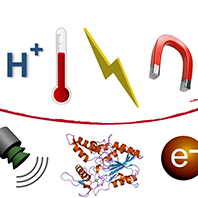 Our collaborative article titled "A Comprehensive Kinetic Study of the Conventional Free-Radical Polymerization of Seven-Membered Cyclic Ketene Acetals" is accepted in Polym. Chem. Congratulations to all! 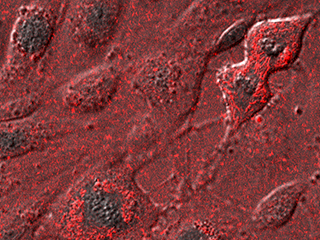 Our Perspective article titled "Polymer Nanoparticles for the Delivery of Anticancer Drugs" is accepted in Med./Sci.